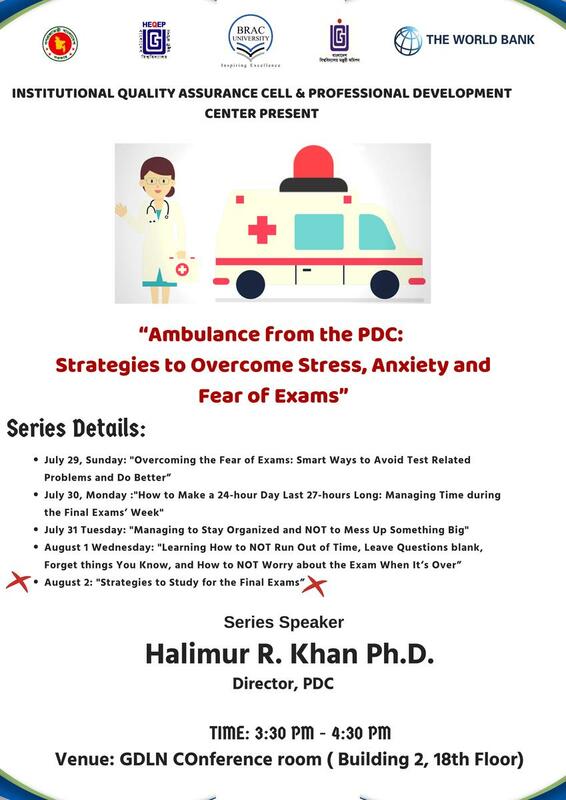 Lecture series by PDC on "Ambulance from the PDC: Strategies to Overcome Stress, Anxiety and Fear of Exams"
The PDC announces a lecture series titled, “Ambulance from the PDC: Strategies to Overcome Stress, Anxiety and Fear of Exams,” for the BRACU students. It is meant to be a semi-formal discussion among the attendees; the goal is to help the students to relieve stress during the week of final exams. There will be FOUR lectures in the series, one each for everyday of the week from 29 July thru 1 August. Each topic will deal with a different aspect of the fear and anxiety of exams.